Halloween is my favorite time of year. When I was thinking about costumes I knew I wanted to be something nostalgic. So I google searched: classic toys, cartoons, foods, music, celebrities, historical events…..just about everything! As I was researching I came across the cartoon The Jetsons. So many fond memories of my childhood on Saturday mornings came rushing back to me. I knew I just had to be Rosie from the Jetsons costume! I went to the local scrap store and gathered my supplies: a box, a cylinder, 2 pencils, 2 big jar caps, 3 smaller jar caps foam scraps, 2 bottle caps, and black fabric. Then I went to my local home improvement store and craft store and bought, 2 pom pom balls, spray paint, blue duct tape white, poster board, and gloves. 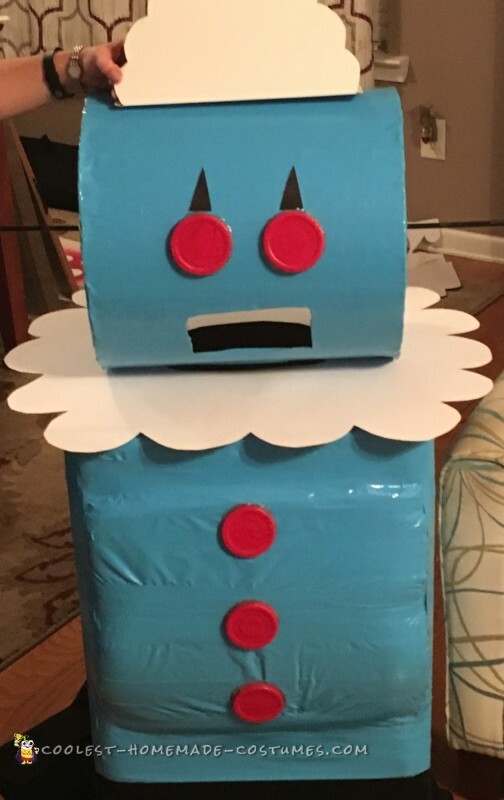 Making my Rosie from the Jetsons costume was time consuming. I worked on it for about three weeks a little at a time. The hardest part was the fitting process. More specifically, getting the head attached to body and making sure I could see out of it through the mouth piece. Measuring the black cloth so it hung without hitting the floor. Cutting the arm holes in just the correct place so that it rest appropriately on my shoulders. It took two people for the fitting. Once I was fitted, I glued foam on the front of the box to make me look rounder. 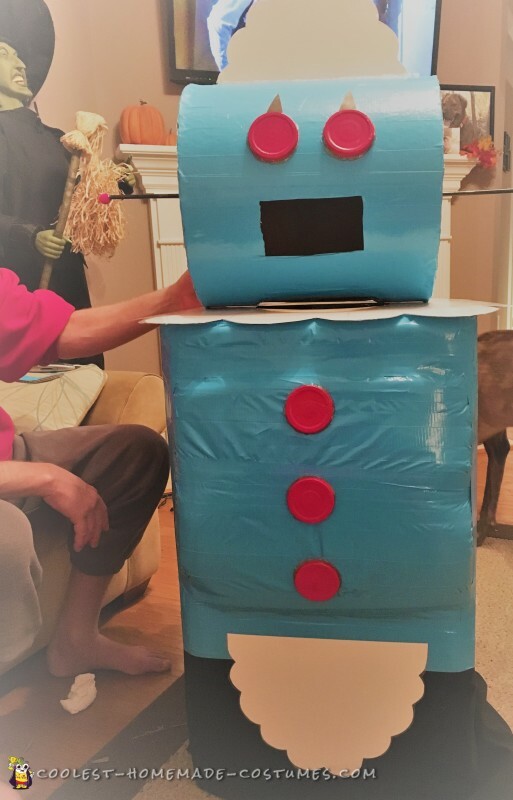 I then used about 8 or so rolls of duct tape called Electric Blue to cover my head, the box, my shoes, and cardboard on my hands to give the robot look. My favorite part was adding the details because then it started to look like her! I used poster board for her frilly white pieces to her outfit and duct taped my card board onto my gloves. I hot glued two black colored pencils onto a bottle cap and glued it onto my head with glued on pom pom balls. In addition, I bought my feather duster from the Halloween Costume Store. I kept my costume a secret and didn’t post anything on social media, in fear of someone copying me. Finally October 30th came around! My time to reveal my costume. I was doing a local bar crawl with my friends and a $100 costume contest. Walking around in the box was the biggest pain! I was sweating and had to waddle around downtown. It barely fit in the car. I carried a draw string knapsack under my costume with tape just in case something happened and my costume fell apart. I couldn’t move through the crowd in it, I couldn’t bring my hands to my mouth, I couldn’t move, I couldn’t go up and down stairs, I couldn’t breathe in it. My friend had to stay with my the entire night to help me in and out of it. I had to use my tape a few times because my antennas popped off. The box dug into my shoulders, even though I added some padding inside. Also, I would take my box off at times and put it down and people would use it as a trashcan and throw items in the whole of my box!!! However, it was awesome to get my picture taken by tons of people that night. Everyone would yell out Rosie!! as I walked down the street. I felt like a celebrity. Everyone assured me that I would for sure win the best female costume. How could I not right?! Then, I posted my picture on social media and it got 100s of likes. It made me feel special and I was bursting with excitement when it came time for them to announce the winner. Here I was hot, sweaty, exhausted, dehydrated cause I couldn’t bring a drink to my mouth, fatigued from getting in and out of the costume…..and they announce the winner. I was devastated. 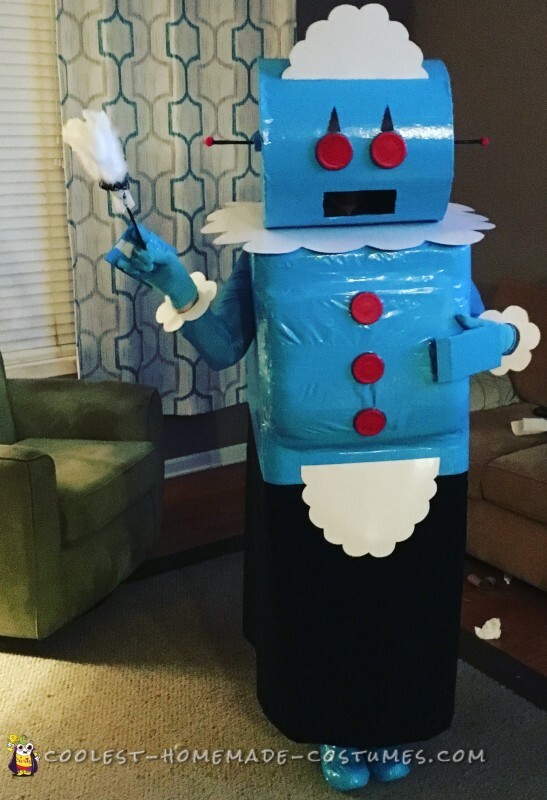 I worked effortlessly for weeks on my costume. And I put in all my labor of love into it. I was proud of it and had suffered all evening hopping from location to location in it for them to announce…… I lost. There was no second or third place. I sat on the street and balled my eyes out. I cried like my best friend had died! Not just a few tears trickling down my cheek. I mean full out water works. I am not joking – I was in shock and I cried like a little baby on the streets of downtown and I am a grown woman. So, I eventually gathered my composure and made the best out of my night as I could. I ended up dragging my Rosie from the Jetsons costume home and it currently sits in my closet. I vowed to boycott Halloween after my loss and not dress up again next year. But here I am, coming across this website trying to get new ideas for this year. I am determined to get 1st place this year!